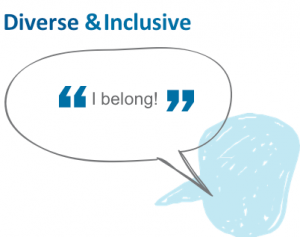 Attracts and reflects the diverse identities, communities and lived experiences in Canada. Values and respects diversity and creates a sense of inclusivity and belonging for all girls. Recruits and engages girls of diverse backgrounds and is accessible to all girls. Examine diversity and inclusion: develop a committee representing each District; gather resources for each District; collect qualitative information for each region; and set direction for the Area. Educate about what diversity and inclusion looks like: multiple training opportunities using the Bias Awareness Equity Training Module. Explore diversity and inclusion opportunities: investigate all avenues open to the Area for examples and help available to our Guiders to prepare and identify for increased diversity within our Units. Increase in alignment between GGC and the Canadian Mosaic. Guiders offering a more balanced and inviting program to all. Girls feeling they have a place where they are safe and accepted. Diversity is the who… the representation of many different types of people (gender, race ethnicity, religion, ability, socio-economic status etc.). Therefore, as an Area we will focus on Strategic Priority #3 in the Strategic Plan 2018-2020.